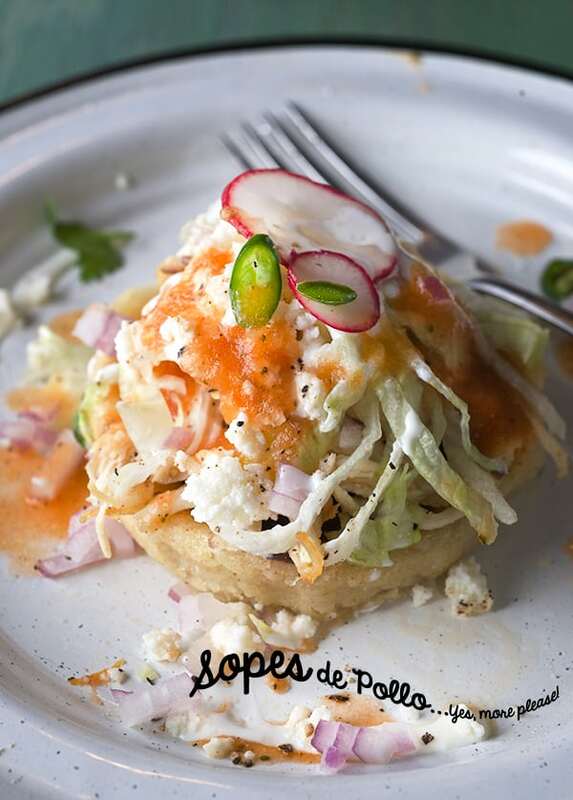 Now, the best way to make these home-style masa sopes, relies on a key ingredient to have a crispy exterior sope and soft inside texture. It is to add a mashed potato to the masa. This gives the corn masa a soft tender bite and a lighter more delicate feel and flavor. Optimally, this recipe is best made with fresh masa. Read below for recommendations. Fried or cooked on a comal? This is your choice. In my version, I added a bit of oil to the griddle (comal) to give the sopes crispy edges and exterior without having to use a lot of oil for frying since it’s just for the two of us. But, if you have more than 8 guests, pan frying them would be the way to go. 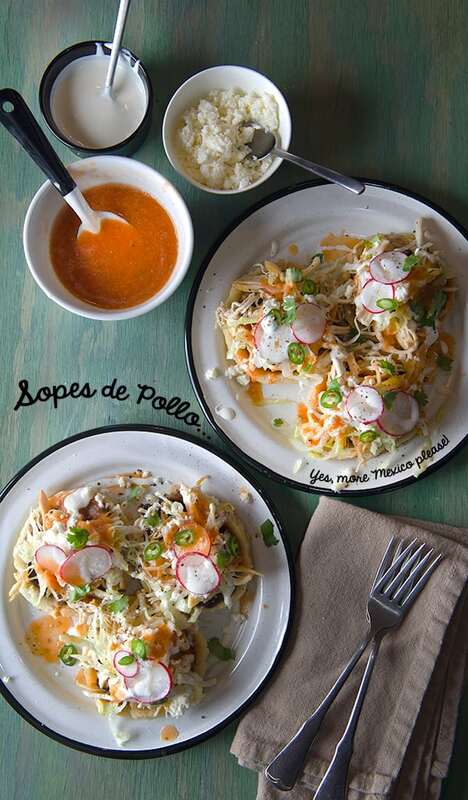 Are you ready to make some of the most delicious Sopes de Pollo – Chicken Sopes in the comfort of your home kitchen? Lets cook! 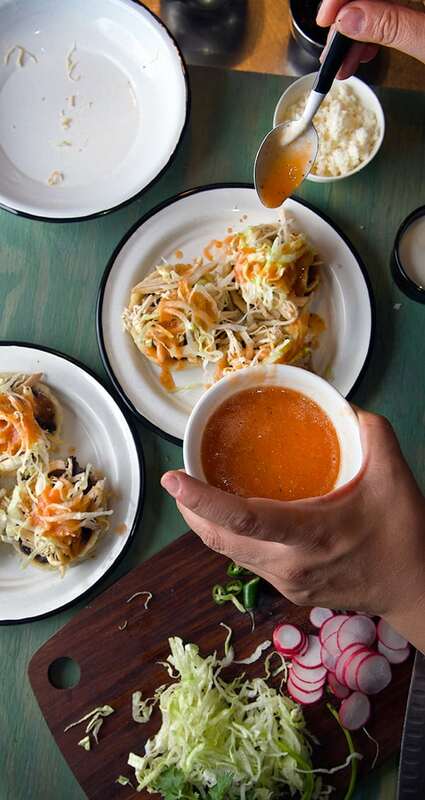 Grab some cold Mexican beer or prepare some Agua Fresca, and the party is on! 1- ¼ cup fresh corn masa or masa harina, I prefer Minsa brand or Maseca. 1/2 cup refried beans, on the lose side, to make them more spreadable. For other fillings, variations check this 8 vegetable taco fillings that will work just as deliciously! Place everything in the blender and puree. Add 1-2 tablespoons of water if the sauce is to thick. *If tomatoes are out of season, I use roasted canned tomatoes from Muir Glenn. 1. 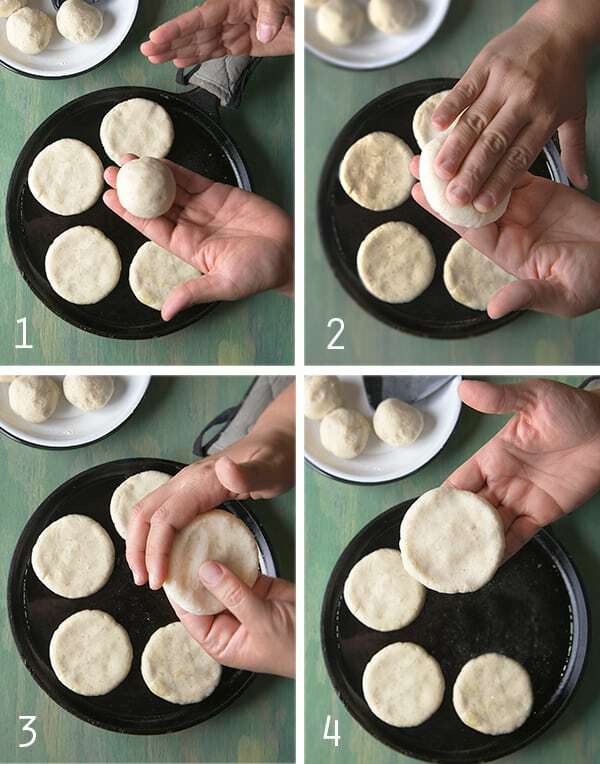 Prepare the masa by combining all the ingredients, mixing and kneading with your hands, until a soft dough ball that resembles a moist play-dough. Cover the ball with a damp clean kitchen towel and let it rest for 15 minutes. 3. 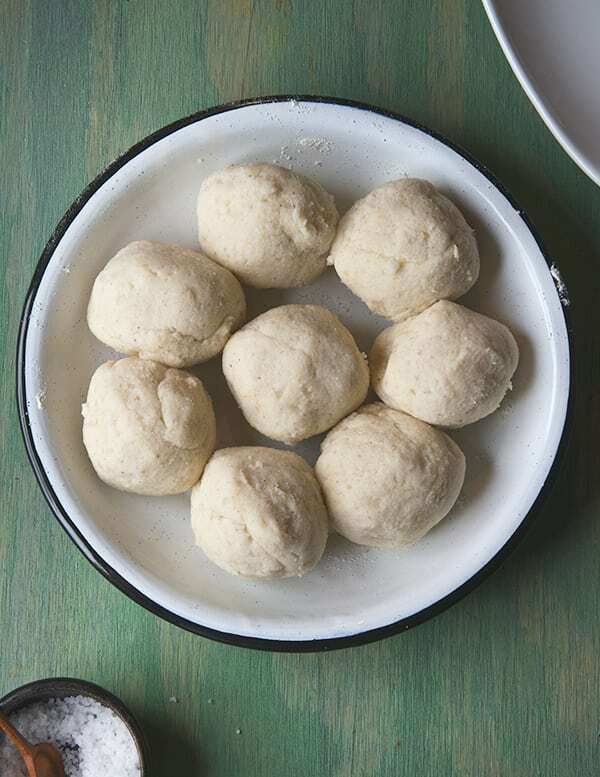 Divide the dough into 8 round balls around 2-1/2”. Take one ball and with your fingers press to make a round flat shape. Then turn around a press again. Use your fingers to keep the round shape on the perimeter until you have a flat round patties around 3”-3 1/2” inches in diameter and about a little less than 1/2” inch thick. 4. Add about 1 tablespoon of sunflower or vegetable oil to the comal and place each pattie on the comal as you keep shaping the rest of the masa. Check the patties every now and then, keep rotating them for even cooking. Give each pattie about 2-3 minutes per side. Start flipping them as they turn golden brown with a few toasty brown spots. Add a bit more oil to the comal when flipping them. 5. Once both sides are cooked, transfer to a plate and with the help of two same size spoons , make an indentation on the sope about 3/8” from the perimeter, then position one of the spoons on the outside of the sope edge and the other spoon on the indentation you just made. 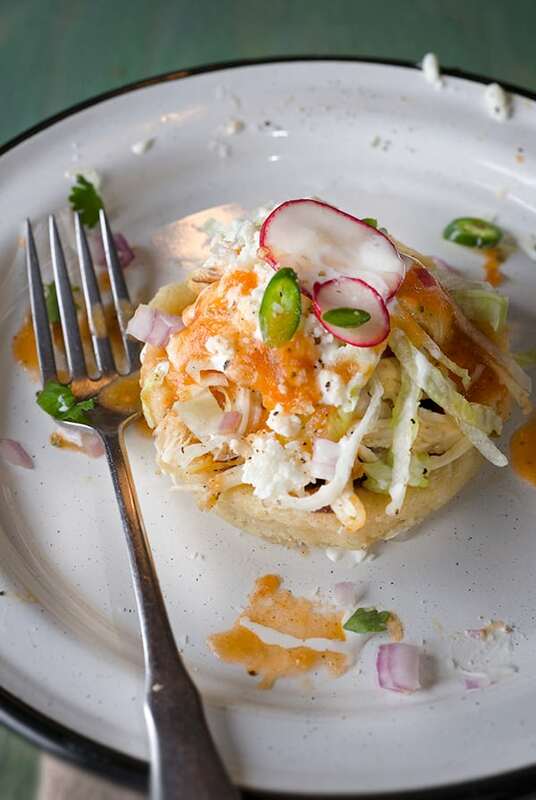 Gently press the masa in between the spoons, like if they were “spooning” to create the sope edge all around. If you feel confident enough, you can pinch the edges with your fingers but be very, very, careful not burn yourself. This masa gets very hot. 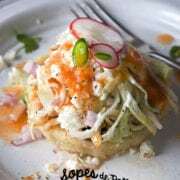 Do this to all eight of them, and place them in the warm comal at a low heat to keep them warm as you shape the rest of the sopes. 6. Once all are ready, fun begins!, I like to spread some refried beans on the bottom, that is my glue, then fill them with the shredded chicken, garnish with lettuce, onions, radishes, spoonful of the simple tomato sauce, drizzle with crema, sprinkle crumbled queso fresco, some thinly sliced serranitos, salt and pepper to taste. You can make a Salsa Verde like this for a variation, or a spicier salsa to serve on the side, like this ones could be a good option. Or your favorite hot sauce, mine: Cholula or Tapatio. 1 -1/4 cup Fresh masa or masa harina, I prefer Minsa brand, or Maseca. 5. Once both sides are cooked, transfer to a plate and with the help of two same size spoons , make an indentation on the sope about 3/8” from the perimeter, then position one of the spoons on the outside of the sope edge and the oder spoon on the indentation you just made. 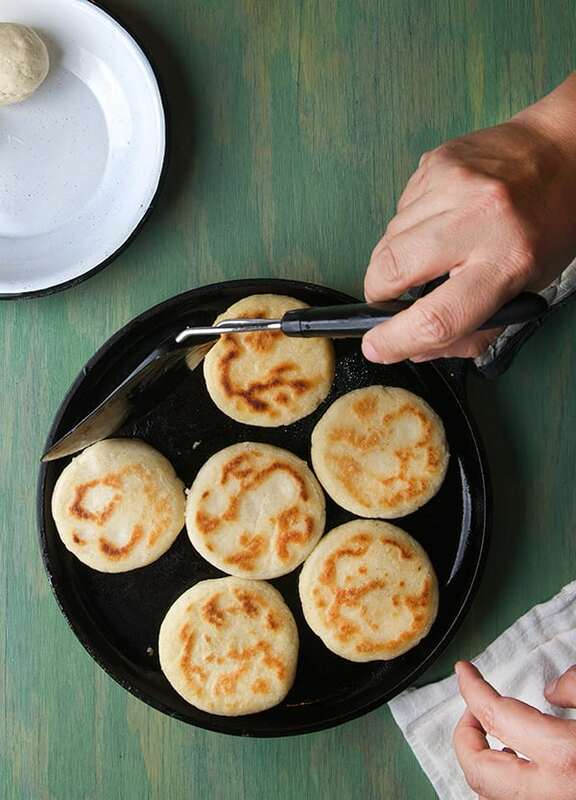 Gently press the masa in between the spoons, like if they were “spooning” to create the sope edge all around. If you feel confident enough, you can pinch the edges with your fingers but be very, very, careful for not burning yourself. This masa gets very hot. Do this to all eight of them, and place them in the warm comal at a low heat to keep them warm as you shape the rest of the sopes.